President John F. Kennedy, First Lady Jackie Kennedy, and their daughter, Caroline, visit with Vice President Lyndon B. Johnson and his daughter Lynda Bird Johnson at the White House, May 17, 1962. Also pictured is Tex, a pony given to Caroline as a gift from Johnson. It’s no secret that the Kennedys loved animals. During the family’s time in the White House, the house and grounds were a veritable zoo. First Lady Jacqueline Kennedy was an accomplished horsewoman who had begun riding at the age of 1. It was only natural that her children would follow in her footsteps, and Caroline and John Jr. started riding almost as young as Jackie did herself. 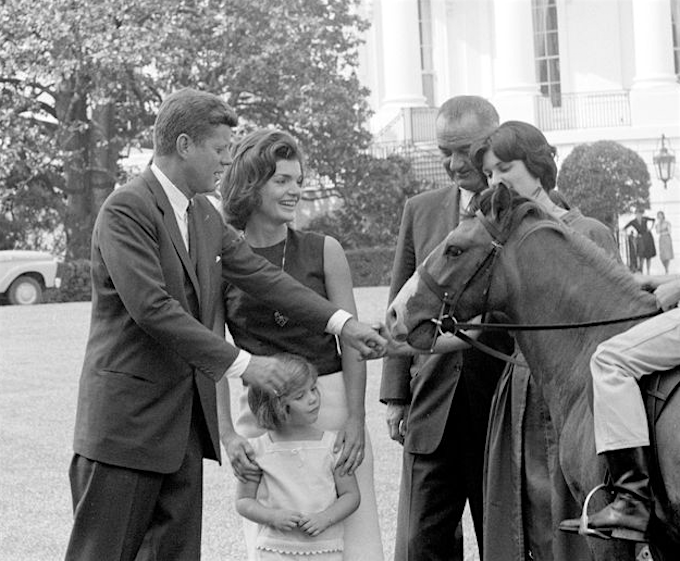 According to the JFK Library, Caroline had two ponies: the famous Macaroni, of course, but she also had a pony named Tex. Tex was a 3-year-old gelding. A Yucatan bay pony, he was brown with one black shoe. Tex was a gift to Caroline from Vice President Lyndon B. Johnson. From all accounts, Caroline enjoyed riding and could often be seen on either Macaroni or Tex on the White House grounds. 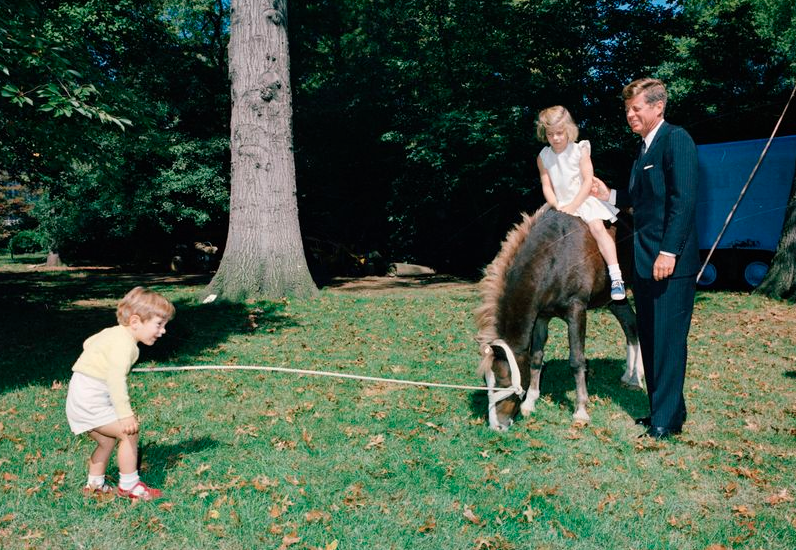 President Kennedy and his kids, John Jr. and Caroline, play with their pony Leprechaun, September 30, 1963. Leprechaun had a tiny saddle with “JFK Jr.” engraved on the saddle plate, all ready for young John-John to begin his riding lessons. Tex and Leprechaun were quieter members of the Kennedy menagerie, and so they didn’t get much press. They divided their time between the White House itself and the Kennedy home on Rattlesnake Mountain, near Middleburg, Virginia.